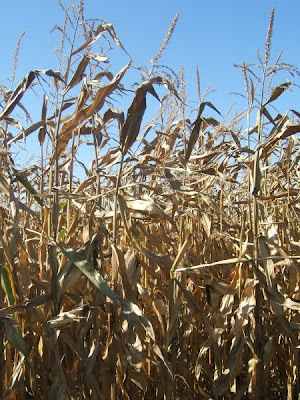 Some of the fields we drove past today were oh-so ready for harvesting and I noticed a few things about them. Scraggly, scrawny stalks with their ears hanging down. But those ears would be a thing of beauty to a farmer. They were fat and plentiful. 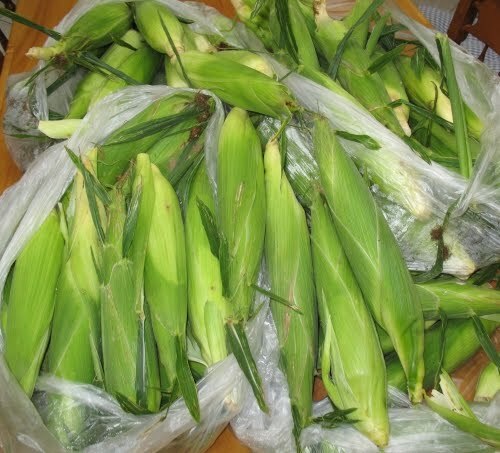 And that, my friends, is the purpose of planting field corn, or any kind of field for that matter. The harvest is the important thing, not the beauty or location of the field, or anything else. It's all about the crop. We can learn from those ugly fields. In our spiritual lives, our beauty isn't important. Sometimes it's seemingly the ugliest ones that have the biggest harvests. Have you ever noticed that? They're more concerned about having a bountiful crop for their Farmer than they are about being beautiful to those driving past them. Our culture today is all about beauty and location and position, but we have it all wrong. It's just hard to remember sometimes when it's all around us. 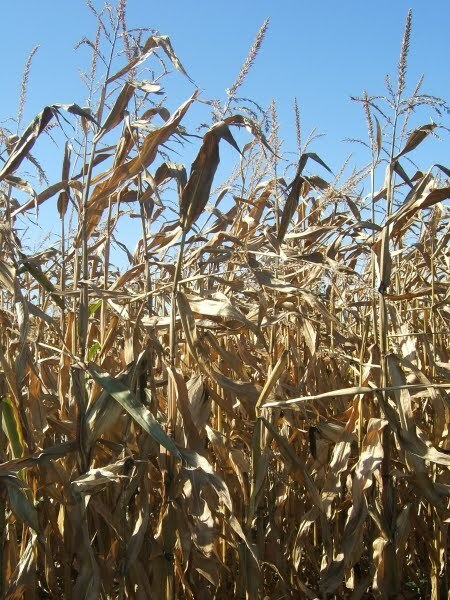 I'm tempted to glean an ugly stalk of corn after the harvesters have gone through and bring it home for my deck post, just to remind me that the harvest is important, not the beauty. Did you see whose harvest it is? It's not ours! It's God's harvest. So tell me, how's your crop looking? The last two weeks have been a whirlwind and my head is still spinning. I may not know what day it is, but I can sure tell you when I need to be in town or to the college next in order to have the kids where they need to be, on time. My two oldest are doing dual-credit classes at a local junior college and although the bulk of their classes are online (Thank God!) they still have to be there 3 days a week for a couple hours. And then Esther (#3 in the line-up) started drivers ed this last week, so she has to be to the local high school in town every-other-day. Yesterday was a bonus day. I had to have 2 of them in different places at the same time, and Jim wasn't able to run the opposite direction for me. On top of that, my writing responsibilities have been heavy (but fun!!) this week. But through all this craziness and busyness and running, I've been blessed. God has strengthened me, kept my head screwed on, and kept us safe on the roads as Abby, my older daughter, has been logging in driving experience so she can get her licence in September. And there have been a few close calls. Isn't it good to know that even when we don't know which end is up or what day it is, God knows!! And He's got it all under control! for an online Bible study! 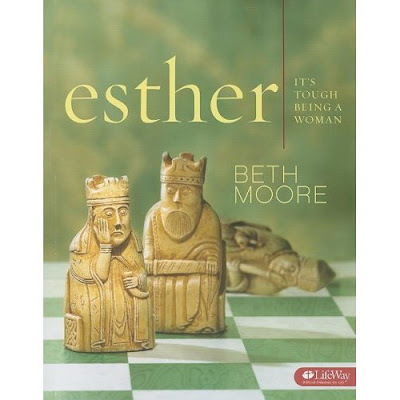 I talked with the ladies at the Bible study I attend, and we've decided to study Esther: It's Tough Being a Woman by Beth Moore. I'd like to invite you along for the journey! Each week we'll do the daily work in the book individually, then on Fridays I'll post a lesson review here—for our group meeting time. I know there are many who cannot make it to a local Bible study group—for years I couldn't for one reason or another, but we can still connect and have some of the Bible study fellowship and ACCOUNTABILITY here. I'm planning on memorizing each week's memory verse and digging deep and knowing I have people checking in really helps spur me on. Speaking of starting—our first, introductory group meeting will be posted here on September 10th. That gives us time to get our books so we're ready to start digging into our lessons so we have Week #1 completed on September 17th. I'm excited about getting started! You can purchase the book through Amazon or your local Christian book store (the LifeWay stores seem to have the best price). For those of you interested in joining the study, but you don't know how to leave comments, it's real easy. 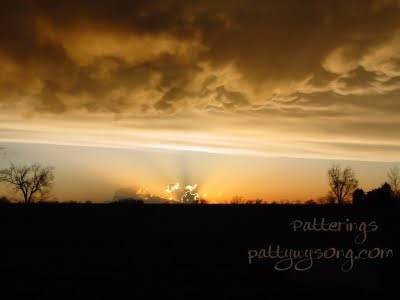 Between my signature, just below, and the bar of flowers, there's a line that says: Written by Patty Wysong. In purple you'll see a number and the word Comments. Click the word Comments and it will bring up a little pop up screen where you can type in your comment. Select Anonymous and leave your name in the comment. This meme started at the FaithWriters' blog and made it's way to Joanne's blog (where I found it, LoL) - and it looked way too fun to pass and I needed a fun breather! 1. Copy and paste the following to the comments and replace my answers with your own. 2. If you have a blog, copy and paste these questions and your answers to your blog. 3. Challenge your readers to do the same on their blog. If you don’t have a blog, skip #’s 2 & 3! How often do you get writer’s block? Occasionally. How do you fix it? Banging my head on the wall usually does something...what, I won't say. Do you type or write by hand? Type! I think I forgot how to write by hand, unless I'm taking notes in church. Do you save everything you write? Yuppers. Do you ever go back to an old idea long after you abandoned it? Sure. Do you have a constructive critic? Joanne is the other half of my brain. She's a lifesaver! Did you ever write a novel? Yes. What genre would you love to write but haven’t? Ummmmm. Dunno. I love contemporary and historical romances and write in both genres. What’s one genre you have never written, and probably never will? Horror!! ::shiver:: Nothing fluffy about that genre! Do you write for a living? As in for real money? Not hardly. BUT I have made some money to support my writing habit. I'm just thrilled to have my habit support itself for a change! LoL Do you want to? Of course. Have you ever written something for a magazine or newspaper? Do online magazines count? If so, I've have articles in both JournEzine and Exemplify Magazine (my absolute fave online mag!!). Have you ever won an award for your writing? Yup, at Faithwriters. Do you ever write based on your dreams? Er, no. Do you favor happy endings, sad endings, or cliff-hangers? Happy endings all the way. I get really disgusted when a book or story doesn't have a happy ending and I won't read it if I know it doesn't. I know, it's pathetic, but hey, I get enough reality in life! So yeah, I write happy endings, too. And now it's YOUR turn! Respond below, put your answers on your blog, or both. Enjoy. I love Tuesday nights. They've become special to me this summer because it's Bible study night with some of the church ladies here. I hafta tell ya, I didn't know how much I was missing out on before we started studying together. Not only have I learned a lot as we've studied Joshua, Judges and Ruth, but the fellowship has been fantastic. Here's the deal. We can do the daily portion of the study on our own, just like we'd do in a regular Bible study and then I'll post on Fridays, here at Patterings, for our weekly meeting. If people are interested, we can set up a group so we can get some fellowship in, otherwise we can just “meet” and interact here in the comments. Bible study, fellowship, and prayer support is something all of us need, but attending a local Bible study isn't always an option. Maybe an online gathering would work for you! It's not decided what we'll study yet and I'd love your input. I love Kay Arthur's inductive studies, but I think it might be time for a Beth Moore study. (Here's a handy chart of Beth Moore's studies.) Are there any that catch your attention? Any that you'd like to do? Recommendations? Our start date will be sometime in September, and next Tuesday night we'll be deciding which study to do. I really would like your input to help us decide. Next week I'll post the details of which study, links, and the date we'll start. So tell me, is this something you'd be interested in participating in? 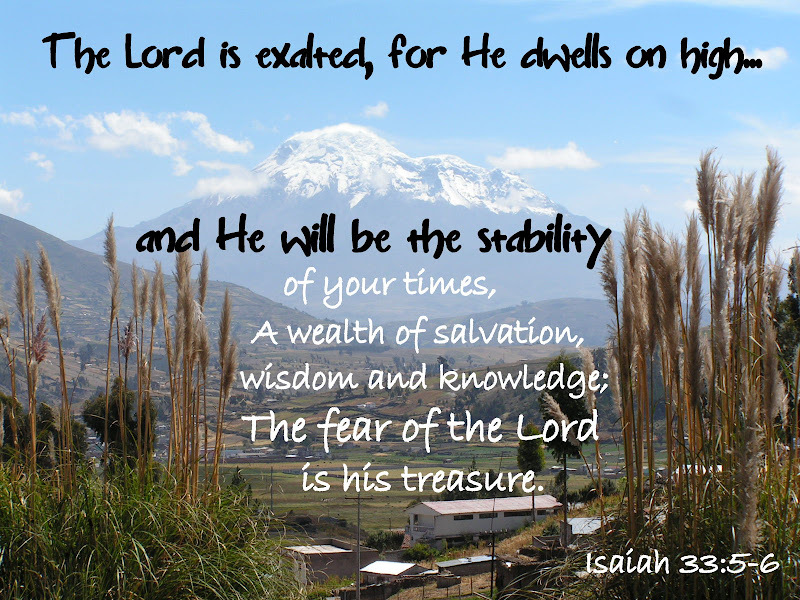 I spent a couple of years in the shadow of Chimborazo down in Ecuador and it quickly became a source of strength for me. Even after all these years it's a symbol of stability and in these weeks of monumental change here at my house, I have a new appreciation for GOD's stability in my life. Someday even Chimbo will crumble, but God never will. Ever. God is the stability of my times and THE wealth of salvation, wisdom and knowledge for me. Exalt the Lord with me! The weather here in Southern Illinois has been awful. So hot and humid! But the other night we were rejoicing that it looked like we'd be returning to normal soon. Normal being in the nineties. LoL. As my husband drove to work the next morning he called home to say there was constant lightening north of us. It took almost two hours for the storm to hit and as I sat doing my Bible reading and listening to the thunder roll, I was struck by how the weather demonstrates life sometimes. When the heat waves hit us in the summer (like we've recently had!) and camps out on us, we look forward to the storm that will break the heat. We're thankful for it and often sit outside, enjoying the storm because we understand and experience the relief it brings. But when it comes to life we tend to sing a different tune even though the same principles seem to apply. Things can heat up fast in life and before we realize it we're sweltering in the middle of a massive heat wave that doesn't appear to be moving off. Life becomes sticky and miserable. What do we do? We start looking for it to break. But it's so easy to forget that heat waves are often broken with a storm, and sometimes that storm can get pretty ugly. The first wave roars down you, completely blocking the sun, and the wind whips you around so you don't know which direction you're facing. And then it seems like the heavens open up. It's not a gentle spring rain. Oh no! It's a hard, pounding deluge, and maybe even hail. That front edge of the storm can be vicious. Sometimes the storm is swift. It comes, it dumps, and it goes, leaving welcome relief behind it. But other times the rain just keeps coming. And coming. And coming. Wave after wave of storms roll through. We're looking for relief but find a string of storms instead that make us wish for the oppressive heat instead of the intense storms we're in. We forget that the storm brings relief. Yes, the storms may cause damage. Branches may come down, flooding may occur, but God works through the storms. We may not see or understand, but by faith we can believe and trust Him to work all things together for good. Remember the end of that verse! “...who are called according to His purpose.” ~Romans 8:28 NAS Not our purpose. His. During life's heat waves and storms we can run to God for shelter. He is our shelter and refuge. Our tower of strength and security even when the storms are raging. Let's take refuge in Him! There is no greater refuge than the creator of the storm. I'm blogging today At the Well about children and service. I'd love to have you join me there!